¥ What is a dinar? ¥ What is a qirat? ¥ What is a carob seed? A carob seed comes from the fruit of the carob tree which grows predominantly in the Mediterranean area. ¥ What is the difference between a carat and a karat? The carat is a unit of mass equal to 200 milligrams and it is used for measuring gemstones and pearls, while a karat is a unit of measure for the fineness of gold, equal to 1/24 part. Pure gold is 24 karat; gold that is 91.6 percent pure is 22 karat. ¥ What is the difference between the gold dinars in the market? The difference is in the purity of gold (22 karat and 24 karat) and the weight (4.25 grams and 4.5 grams). ¥ What is unique about the Nabawi Gold Dinar? 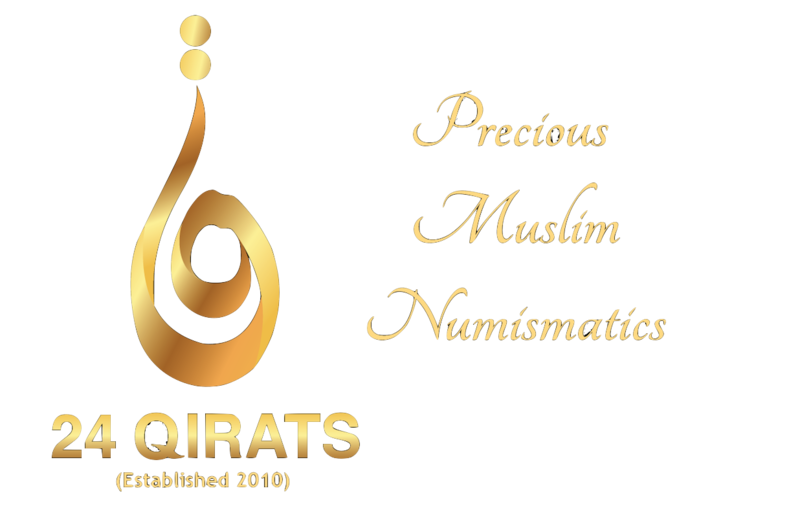 The Nabawi Gold Dinar produced by 24 QIRATS are of pure gold (.999 purity) and weighs 4.5 grams in compliance with the hadiths of the Holy Prophet which relate to dinars and the pillar of Zakat. ¥ Where does the name Nabawi Gold Dinar originate from? Nabawi Gold Dinar is the present day terminology used to refer to the gold coinage in circulation in Makkah and Madinah during the lifetime of the Holy Prophet . ¥ What does the design on the Nabawi Gold Dinar mean? One side (obverse) has the Thuluth calligraphy script “Muhammad khatimul anbiya” which means “Muhammad, Seal of the Prophets) – a title bestowed upon the Holy Prophet (sallallahu ‘alaihi wa sallam) just before the miraculous Night Journey (al-Isra’ wal Mi’raj) to Masjidil Aqsa in al-Quds The opposite side (reverse) has the Thuluth calligraphy script of “Qadhiyallahu annahu la riba” which means “Allah has forbidden you to take riba”, an excerpt from the sermon of the Holy Prophet given on the day of Arafah during Hajjatul Wida’ (Farewell Hajj) in the 10thyear of Hijrah. ¥ Where should I keep my gold dinars? Wherever you keep your precious belongings, in a hidden place, in a safe at home, bank or private safe deposit box operators. ¥ Where do I sell / liquidate my gold dinars? You can sell to any individual who is willing to purchase them from you or you may get in touch with 24 QIRATS to assist you You can also sell to any goldsmith where gold is tested and weighed, and the value is determined based on market prices. ¥ How do I know the current price for the Nabawi Gold Dinar? ¥ What are the benefits of keeping the Nabawi Gold Dinar? The Nabawi Gold Dinar is not an investment, but a way to diversify your savings portfolio as the price of gold is on a constant upward trend (please refer to the Qommodities page). The Nabawi Gold Dinar is a Sunnah coinage. ¥ How do I know if the gold in my dinar is authentic? You can test your dinar at a goldsmith or send it to any certified assayer as the Nabawi Gold Dinars produced by 24 QIRATS have been assayed and assured of a minimum purity of 999 Gold. ¥ How can I use my Nabawi Gold Dinar?